The purpose of this web page is to guide you through various money issues from God's perspective. The Holy Bible contains at least 2,350 verses dealing directly with wealth. Many of these verses give us specific instructions for how to handle our money. Over my years of financial counseling, I have noticed, time and time again, that when you handle your money God's way, He blesses your effort. He may choose to bless it with money or material posessions, but He may also choose to bless it in some other way. God didn't promise how He would bless us when we do things His way; but, He did promise that He would bless us. Everything on this page is presented from a Christian perspectve. The articles here offer more philisophical rather than practical guidance. For actual techniques, methods and step-by-step guidance, please read the articles on my Financial Page at Eclecticsite.com. God's wisdom can teach you what to do and how to deal with it. Through the Bible, God teaches us how to improve our financial lives. Have a lot of money saved up. Have money you want to invest. Have received a large inheritence. Want to leave an inheritence to others. Are wealthy and want to know what to do with it. Want to use your money to help others. God's wisdom can each you what to do and how to do it. Through the Bible, God teaches us how to best use the money He has given us. These articles are presented in no particular order. How to get started handling money God's way, and why. How does God feel about debt? Is debt a sin? What does God teach about saving? Should we save, and if so, how much? What does God teach about investing? Is it all right to invest to get ahead? Can investing sometimes be just a form of gambling? Is investing, even in the stock market, all right or should we always work for our money? Can we save for the future and still say we trust God? How can we put money away for emergencies and then say we're trusting God? Is it all right to want to be wealthy? How does God feel about us wanting lots of money? What does God want us to do with our wealth? Whether you have much or have little, what does God want you to do wtih it? My neighbor has nice things and I want nice things too--is that coveting? Is it coveting to want nice things like other people have? Should I tithe? Do I have to tithe? What's in it for me? A big bag of shoes. God often blesses us in surprising ways. Why you should get financial counseling. No money, Lots of money, debt, no debt, stress or no stress--financial counseling can help you? What is the relationship between money and evil? My favorite financial Bible verses. A collection of finance-related Bible verses I use during financial counselling and teaching financial classes. 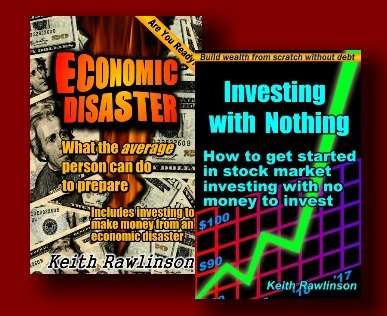 After you have read all of the articles offered here, be sure to check out my main financial page on Eclecticsite.com. There, you will find many more of my articles dealing with such things as becoming debt free, buying cars, buying houses, saving, investing, starting a business, becoming wealthy, and much more. If you would like to see an article pertaining to a particular topic, please contact me and let me know.